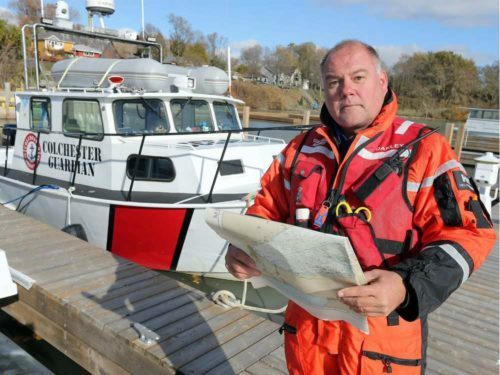 Dual passions of boating and volunteering drove Jim Oakley to join the Canadian Coast Guard Auxiliary, but the adrenalin rush and the satisfaction of saving lives got him hooked. The crew – men and women who include small business owners, a nurse, paramedics and a doctor – all work full-time jobs in addition to volunteering their time, not only for rescues but for extensive training. The group ranges in age from 24 to 55. Volunteers all put up their own money for their personal safety equipment. Oakley said that cost ranges from $1,000 to $1,200. Their winter suits alone cost $400. Like all vessels of the Canadian Coast Guard Auxiliary, the 31-foot Colchester Guardian is entirely manned by volunteers.